And after a second round of global consultation, it has arrived – at Roman Noon, the instrumentum laboris (baseline text) for October's climactic Synod on the Family was released... for now, however – much like last year's first volume – the full sequel is only available in Italian. Stacking out at 147 paragraphs – some 20,000 words – the text is arranged around three pillars: the challenges families face, the "discernment of the family's vocation," and "the mission of the family today," each of them slated to take up a week of the discussions at the 4-25 October assembly. Among other highlights, the final portion of the framework deals with the proposed changes of practice cited by their supporters as necessary for the church to better respond to families in challenging situations amid current pastoral practice. 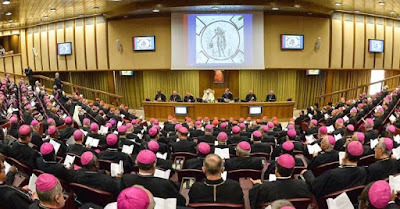 On the assembly's most hot-button issue of all, the instrumentum speaks of a "common accord" among the world's bishops toward "eventual access" to the sacraments for divorced and civilly remarried couples, but only following "an itinerary of reconciliation or a penitential path under the authority of the [diocesan] bishop," and only "in situations of irreversible cohabitation." The text cautions that the proposal is only envisioned "in some particular situations, and according to well-precise conditions," citing the interest of children born in a second union. On a related front, ample treatment was given to the state of marriage tribunals, with calls for a "decentralization" of the annulment courts and the floating of the "relevance of the personal faith" of spouses in terms of their understanding of the marital bond as a means for declaring the nullity of a marriage. In particular, the latter point echoes a longstanding line of the Pope's – having quoted the impression of his predecessor in Buenos Aires, the late Cardinal Antonio Quarracino, that "half" of failed Catholic marriages there "are null" solely on the grounds of unformed faith, a papal commission formed quietly by Francis last summer is studying possible changes to the annulment process independent of the Synod itself. No timeline is set for its work. Elsewhere, three paragraphs were devoted to pastoral ministry to families "having within them a person of homosexual orientation." While reaffirming the 2003 CDF declaration that "there exists no foundation whatsoever to integrate or compare, not even remotely, homosexual unions and the design of God for the family," the text urges that "independent of their sexual tendency," gays "be respected in their dignity and welcomed with sensibility and delicateness, whether in the church or society." Perhaps most boldly – reflecting a key emphasis of one of the gathering's three presidents, Cardinal Chito Tagle of Manila – the text emphasizes that "The Christian message must be announced in a language that sustains hope. "It is necessary to adopt a clear and inviting communication [style]," the instrumentum reads, one that is "open, which doesn't moralize, judge, nor [aim to] control, and bears witness to the moral teaching of the church, while at the same time remaining sensible to the situations of each person." Along the same lines, the theme of "mercy" – the core of the extraordinary Holy Year conceived by Francis and opening in December – runs pointedly throughout the document, with the term cited over 30 times. 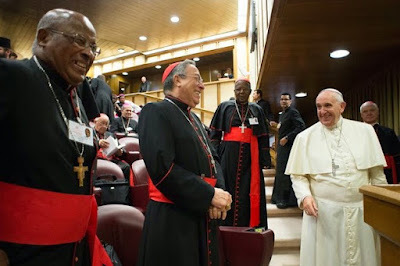 Arguably in a hand-showing of the Pope's intent, the Synod's conclusions will be entrusted to the pontiff for him to decide upon, with the results likely to emerge sometime in mid-2016, squarely in the midst of the Jubilee Year he's chartered. All that said, especially given the topic's place at the core of the church's long polarization on family issues, one word was especially conspicuous by its absence: "contraception." Unlike its Extraordinary precursor last October – a mostly ex officio group dominated by the presidents of the episcopal conferences – the Ordinary Synod is composed of a far larger group, with the largest national churches eligible to send four delegates each. While the slates of elected Fathers have been rolling out over recent weeks – most controversially, the Belgian bench's choice (with Rome's approval) to be represented by Bishop Johan Bonny of Antwerp, who's encouraged the church's "formal recognition of relationality... also present in gay couples" – Francis still has yet to release the slate of his personal appointees who, even if they have an equal vote to the elected members, arguably carry a greater clout in the deliberations due to their selection ex Pontifice. Arguably the core ad intra element of Francis' "revolution" of governance for the universal church, as this September marks the 50th anniversary of the Synod's creation by Pope Paul VI during the Council's final weeks, a celebration of the milestone is planned to take place during the October assembly... and with it, likely an even further elevation of its role for the path ahead.